Could your morning routine use a makeover? Many of us do not view the morning as a sacred time to ease into our day. We often have a million and one things to do and our time is consumed with trying to save the world all before 9 am. Your morning doesn’t have to be this way. Transforming your morning routine will require a bit of planning but it’s so incredibly worth it and one of the best things you can do for your body and spirit. When you wake up and jump into the day without ease you may be neglecting your spirit’s needs. Getting into the practice of a beautiful morning routine will make the world of difference in how you start your day and how your day treats you. We all know those days where our morning starts in chaos and feels just like one faux pas after another ensues and you wind up defeated wishing you could hit the restart button. It’s true that we all don’t have a ton of time in the morning to ease into the day but we want to show you a few things you can do in the morning (some only take 5 minutes) that can make all the difference in how you approach your day. As you build your morning routine practice you can add more things that feel good to you and pretty soon you will be starting your days with ease and grace. This in turn makes you more productive in your day and overall a better caregiver to yourself and everyone else in your life. Remember it is not selfish to take care of you first. Lemon water. If you do nothing else, make sure you drink a large glass of water with some lemon first thing in the morning. This will rehydrate you and make your water easier to drink. Not a fan of lemon? Pick another fruit that calls to you and add it to your water. Deep breathing. Take 5 minutes even before you get out of bed. Put one hand on your heart and take about 10 deep breaths and focus on nothing but your breath. Set one intention for the day. You can think of your intention or write it down. One sentence and you are done! This conscious act sets the wheels in motion to make this intention happen. Don’t underestimate the power in writing your goals down. Think of 5 things that make you blissfully happy or laugh. Spend 5 minutes thinking of those things and getting into a state filled with good vibes. 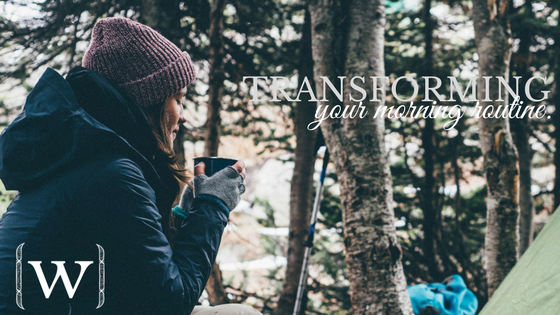 Have you tried any of these morning transformers? Do you have other things you do to kick off your morning? Why don’t you share them with us and then go conquer your day! Benefits Of Lemon: When Life Gives You Lemons.